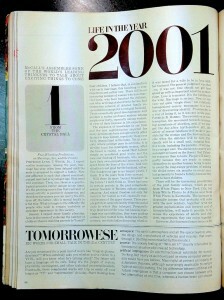 White’s comments on the future 2001 seem rather prescient to me. I guess he draws on repeating patterns through history to get his grasp on how politico-social mores will manifest themselves both technologically and socially in any half-century period. His “Medieval Europe foresaw planes, cars, submarines.” (Smithsonian Oct. 1978) shows a similar understanding of cause and effect in what is and what will be.